Kirk Herbstreit has always existed in a strange middle-ground as a college football analyst for ESPN. His spot as one of the faces of the sport for the biggest sports network in the country gives him enormous clout. He commands an important role as not only a broadcaster but also as a representative of the network and the sport itself. It’s the kind of role he usually takes seriously. Being a college football fan can also often bring you into a strange meta-space, which is what happened when Kirk scolded Pac-12 members for complaining about the game times it was afforded by ESPN…while on ESPN. He went as far as to say “you should be thanking ESPN…because your games are seen” in a rant that would have been called Trumpian if that were such a thing at the time. He’s also been a strong defender of the EA Sports NCAA Football video game franchise and the usage of student-athlete likenesses for free. He even noted that he would gladly do it for free, not really taking into account that he’s already a millionaire thanks in part to the efforts of all those student-athletes. All of which is to say that Kirk Herbstreit has some questionable thoughts about college football and the way it works. That brings us to his appearance on The Paul Finebaum Show on Tuesday. Herbstreit was there to discuss the College Football Playoff, specifically the fact that Georgia did not make the cut. 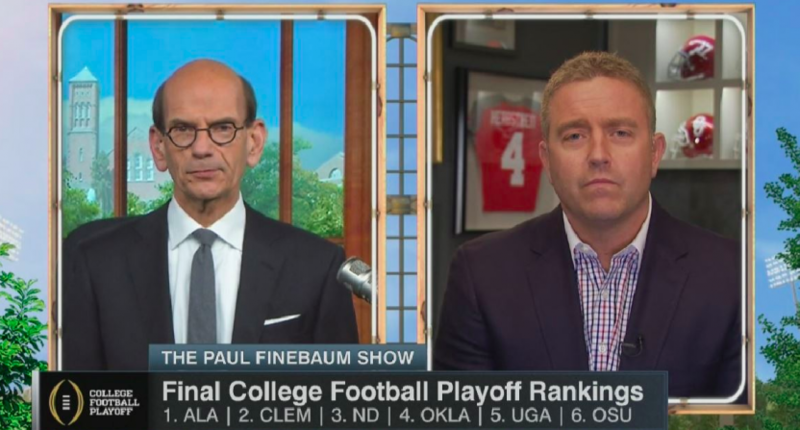 Herbstreit has been a huge proponent of the Bulldogs making it into the playoff in spite of their two losses, citing that their body of work was still as good if not better than Oklahoma and Ohio State. There’s a nuanced argument to be made that Georgia deserved the spot and another shot at Alabama. However, Kirk went in a different direction. Raise your hand if you’ve been a longtime fan of college football, and college athletics in general, and actually think politics has never been involved in the decisions behind it? Politics, however you want to define that, is as longstanding a tradition in the world of college football as the Stanford Band or Howard’s Rock. Politics drive coaching hires. Politics drive schedules and conference alignments. Politics drive perception and rankings. And politics most certainly influence the way the sport determines its champions. Always has and almost certainly always will. College football is inherently political in just about every way it’s built. You can’t just say that “politics” suddenly reared its ugly head in college football because the team you wanted in the fourth slot of the College Football Playoff got passed over. That’s just sour grapes. The other big news of the day was Urban Meyer’s impending retirement. The Ohio State coach looms large over the Big Ten Conference and the sport in general. So does the assumption that he’s only really stepping away because of the Zach Smith scandal that rocked his program and almost cost him his job (in theory). Given that he’s “retired” before only to return with a fresh start at a different program, there’s a good reason to think he’ll do it again here, with the smart money being on USC in two years. Meyer didn’t exactly dissuade this notion either, telling reporters that “it’s a complicated question” when asked if he’s actually retiring. Meanwhile, Kirk, who appeared on SportsCenter Tuesday morning as well, didn’t see it that way. “An Ohio State guy to his core.” Sure, Meyer got his master’s degree at OSU and spent seven seasons as their head coach, but you’d be hard-pressed to say he’s an “Ohio State guy.” Meyer spent almost as many years (six) coaching the University of Florida and has never really intimated any kind of loyalty or passion beyond whatever team he was coaching at the time. He’s done nothing to convince anyone he won’t just snap up the next great gig to open up (especially considering so many schools would love to pay him whatever he wants to win championships for them). In fact, Meyer has always seemed most concerned with his own legacy, and now that it’s tarnished, he’s probably going to want to go someplace else where he can attempt to put the shine back on. There’s nothing about him that says “humble” and certainly nothing that says “loyal,” unless of course you’re one of his assistants and you beat your wife. Herbstreit told Finebaum that he is “loyal” to college football and perhaps that’s where all this stuff comes from. At the core of all these strange decisions and opinions seems to be a desire to see the sport and the adults who run it as honorable and pure. Otherwise, perhaps he’d have to see the seedy underbelly underneath it all for what it is. And that’s certainly not what ESPN pays him to look at.